I'm sitting in the sunshine soaking up every ounce of this early Oregon spring and welcome the quiet warmth and opportunity to rest. February hit against my soul in the best and worst ways. Our entire reality changed all at once as we became real-life foster parents. In less than one minute in a parking lot where we made the transition happen, we went from a family of two + a dog to a family of three + a kiddos new best friend. Everything changed in an instant. Forgive me as I share no real details about this kiddo or much of the unfolding story - I am a keeper of this story and it isn't mine to share. Just know it's going better than the horror stories we hear about fostering, and our home is now wild and lovely as we actively work toward reunification. At the exact time this new season began, my ministry life changed as God started bringing to life dreams He placed on my heart over a year ago. Waiting on God's timing has been a consistent theme over the last 5 years of my life, but when God says "go! ", it's usually all at once and you have to catch your breath often. That's where I am now. Catching my breath, forcing myself to rest and slow down, asking God to speak right to me. While He has been making a way in the wilderness, I'm still here in the wild. Let me tell you, the wilderness is a beautiful place to see God moving and at work but it's also incredibly isolating and discouraging at times. When we don't set our eyes on the right things, we lose all sense of focus and direction. So what do we do when we've lost focus and direction? 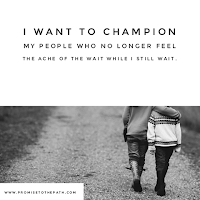 What happens when discouragement settles into our bones and no matter how much we pray or fast or cry or vent the scale weighing our heartache and disappointment doesn't budge? In 2 Chronicles 20:21, we see Jehoshaphat appointing people to sing for the Lord and literally put the worship team on the frontlines, in front of the armed forces. Not only was this a physical battle (the army was still with them), but they recognized there was also a spiritual battle. Can you imagine being a worship leader at this time? Right about here, I'd be praising God that I am tone deaf and cannot sing, seriously! They sang and praised God and then everyone who came to ambush Judah ended up attacking one another. Verse 24 says that when Judah came to a place overlooking the wilderness, they saw everyone defeated. Judah had been delivered from battle. You have to go read the story for yourself, it's incredible. 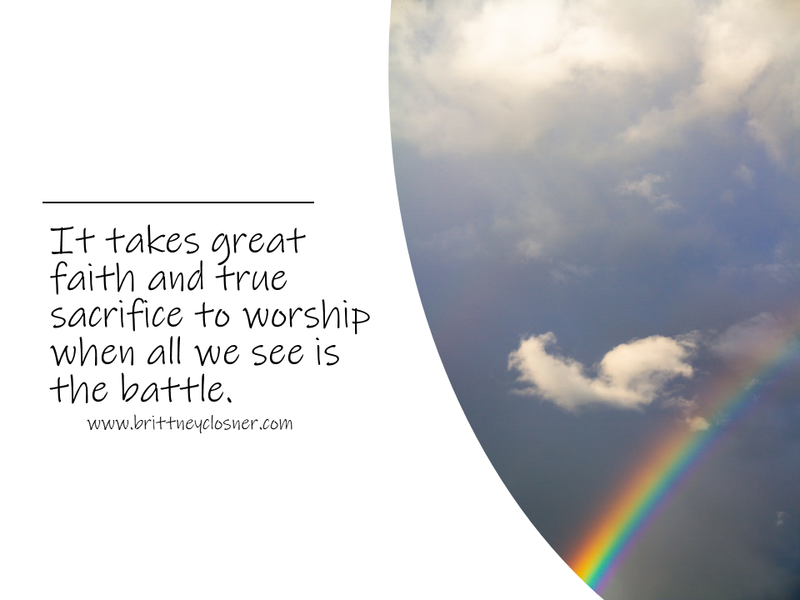 A friend recently reminded me of something I've been taught long ago: worship is your weapon. We see it here in 2 Chronicles, we see David in the Psalms proving this to be true: it takes great faith and true sacrifice to worship when all we see is the battle. How quickly I forget this. I received a worship album the same week my life got tossed upside down (how's that for timing?). 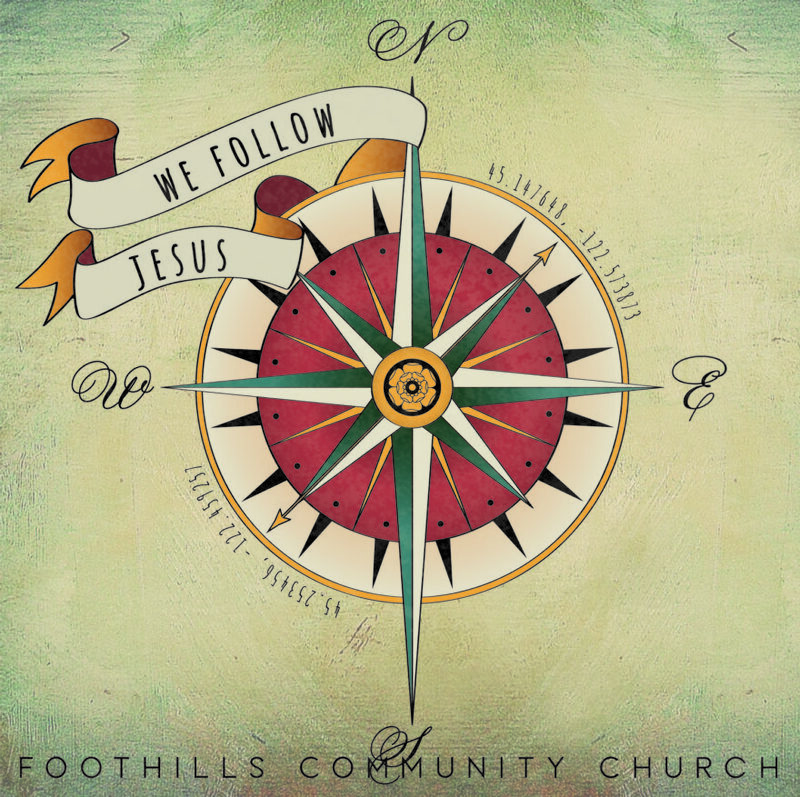 My church had just released a short album and two of the songs on here have been my go-to over the last few years, more so in the last 7 weeks. I often pour out my heart and soul to God, singing with truly joyful noise and wonky notes - I lay it all out to Him and ask Him to handle the pieces in the way only He can, but there's something about two of these songs that bring a weapon to my battle. "I need to see you, Lord. I hold my hands up high, believing you'll provide." and I rest my weary soul. It takes great strength, humility, and sacrifice to trace the rainbow, God's promises, to remember what He said, when you're experiencing the downpour of heartbreak, confusion, and defeat. These lyrics and the repetition sink into my heart and remind me what I sometimes forget: He is the love that will not let me go. There is rest here, with Jesus, and our life is safe in our Savior's hands. A special bonus, my dear friend Sarah is the one singing this song. This beautiful voice has sang over me, prayed over me, and has been a safe space for my heart to land in some really trying times. To know what a faithful and beautiful woman of God is singing these words along with me in the dark spaces of my discouragement and hurt provides me such comfort. God gives us these gifts and I am so grateful for them. Give your voice to God. Give your worship to Him. Worship is your weapon, too, this isn't a secret held just for me. Turn on that song, the one that just came to mind, and sing your heart out, let it tumble out of you. Don't hold back in fear or anger or defeat: your worship puts you on the frontlines of the battle, where you get to watch miracles. You'll see the rainbows through the rain soon enough. 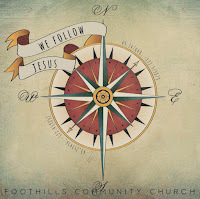 Purchase the Worship EP from Foothills Community Church here. You can have a CD shipped to you (only $6 shipped! ), or purchase through various online avenues. Let these songs be your own personal battle cry. At the VERY least, download You Have My Heart and sing of God's beautiful promises and love along with me. God, I still want a baby.